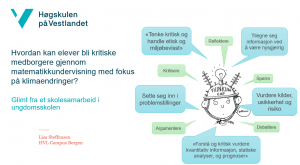 Presentation at Realfagskonferansen 2018 HSN Høgskolen i Sørøst-Norge. Title of presentation was How can students be(come) critical citizens through mathematics education in the context of climate change? Content was to show how three teachers and their students had explored this throughout a year.